CTU wish to inform potential investors about the draft auction terms for the 700 MHz and 3400-3600 MHz bands. 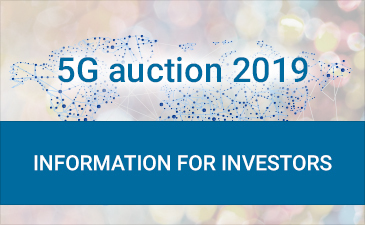 The auction is planned to take place in the second half of 2019 and will include favourable conditions for new entrants. For more information please consult the dedicated page or contact the Spectrum Management Deparment at aukce@ctu.cz. At the ITU Plenipotentiary Conference held now in Dubai, U.A.E., the Czech Republic was successfully elected to the ITU Council. See all elections results here. Presentations from the conference Circle of Digital Life which was organised by CTU on 20 September 2018 are now available at our website.